Kraft did a pretty decent job of capturing the look of the dispenser seen in the film. Oh, what's that you say? You don't remember what the film version looks like? Well take it away Spock! 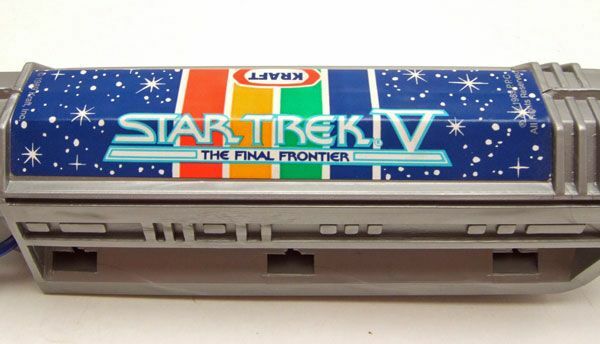 Maybe it's just me, but the coloring and design of the label always reminded me more of something promoting Star Trek TMP rather than Star Trek V. Is it just me? Anybody else? Hello? 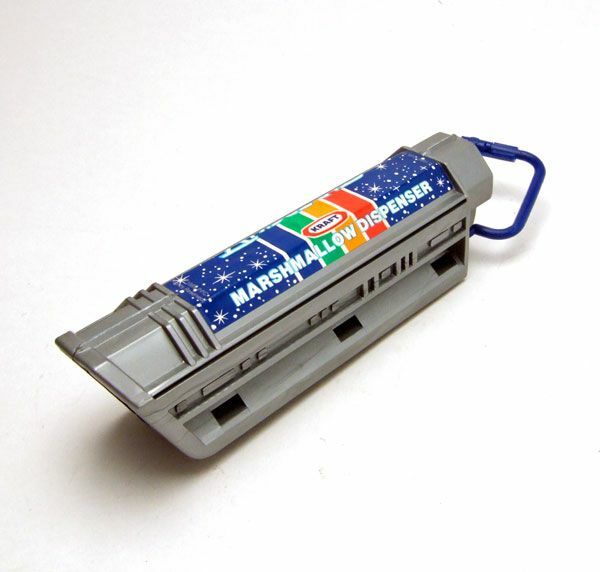 ...then as you slide it open again, the marshmallows are pushed out of the opening by a little panel inside the dispenser. Way cool! Alas, I didn't have any jumbo marshmallows to show you guys what it looks like, nor did I really want a sticky dispenser mess on my hands. 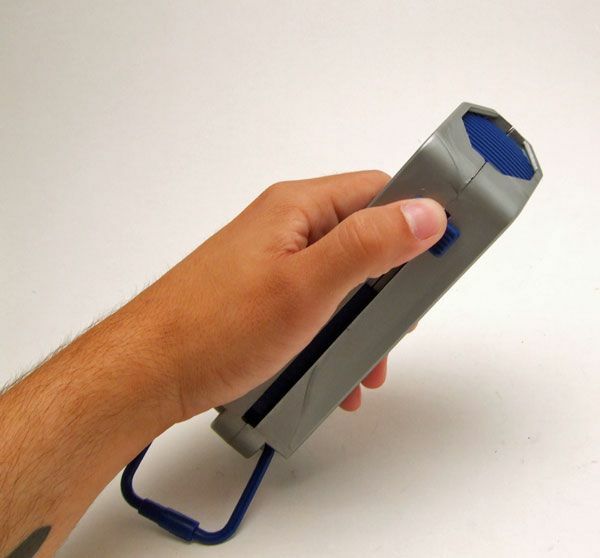 Also included with your dispenser are a plastic fork and spoon. 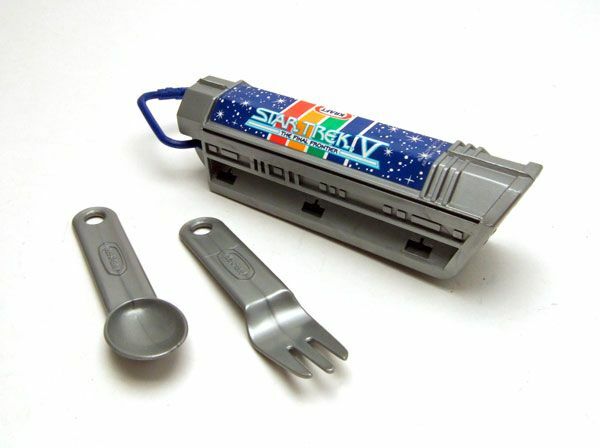 I don't know about you, but I don't usually eat my toasted marshmelons with a fork and spoon. 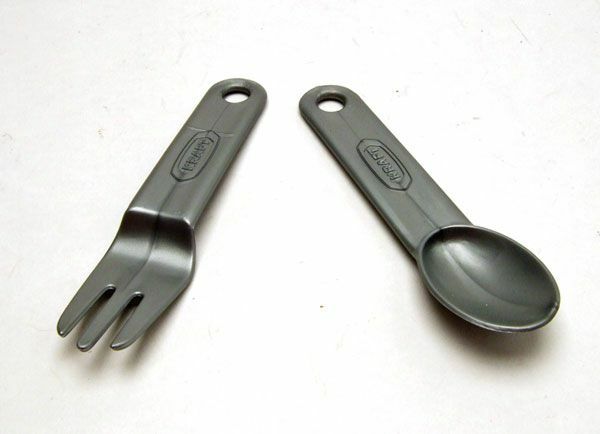 One can only assume these were included to make this an "all-in-one" camping set. 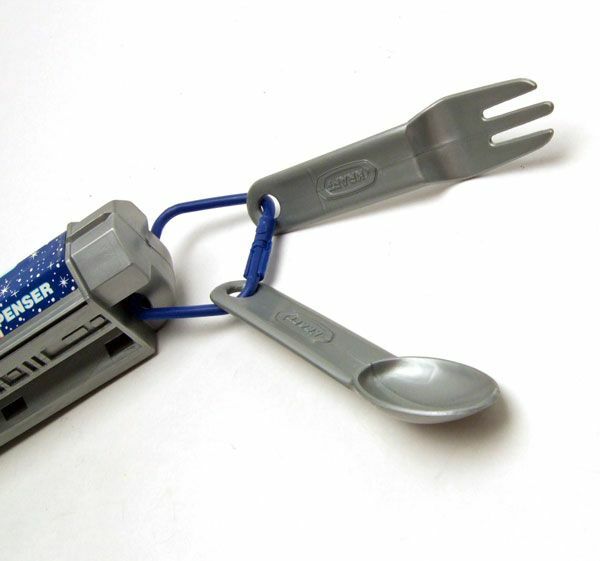 The fork and spoon can attach to the dispenser using the large blue clip inserted on the end. 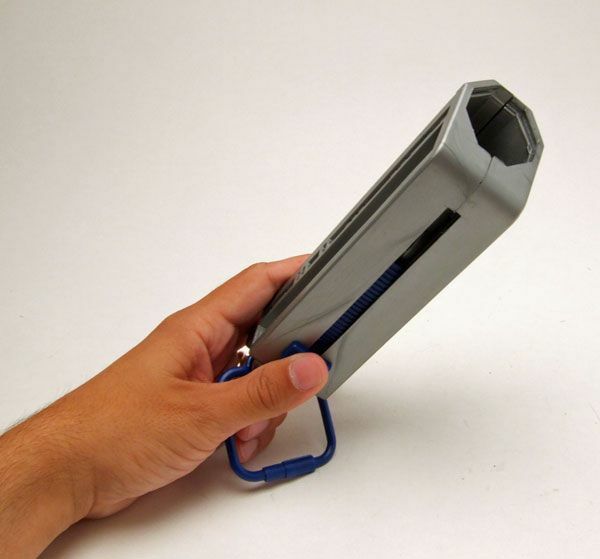 You can also use this clip to attach the whole rig onto your belt loop. Because nothing says "expert camper" like a guy with a marshmallow dispenser hanging from his pants. So there ya go... the second half of the Trekkies-inspired spotlights. The dispenser also included a certificate "signed" by Kirk, but I left that at home so you'll have to wait for me to get around to scanning and adding it to this entry. The real question is...do you need this? 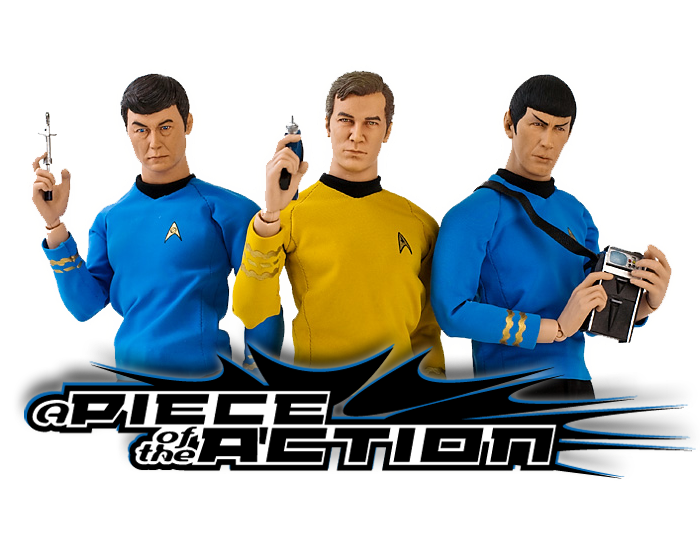 Nah, probably not.... but it is one of the crazier licensed Trek products to get released so it might be worth grabbing as a novelty. 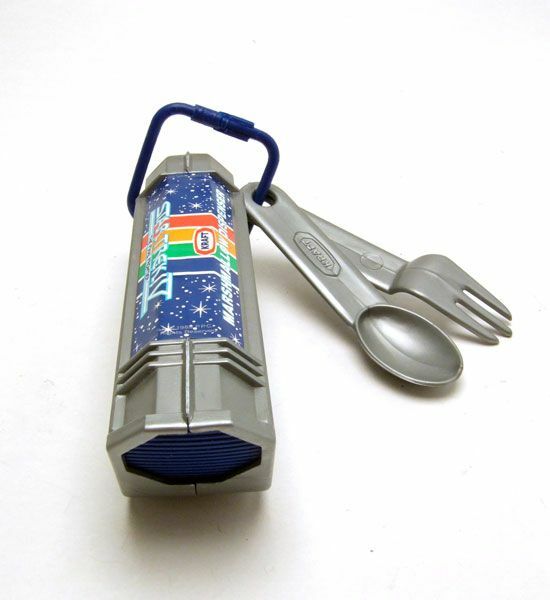 Maybe the fork and spoon were included because the movie device could dispense other foods as well? Like sausages? I have this piece as well and even recently looking at it and thought "what was I thinking" when I ordered it. It is an odd collectible. 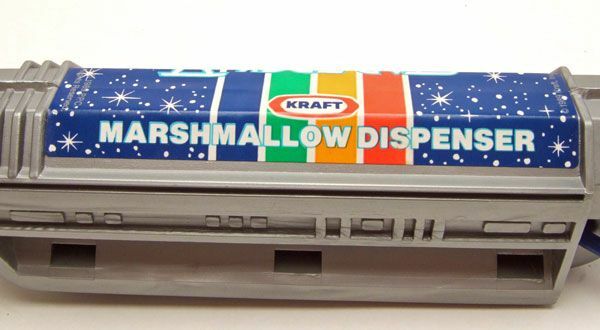 This marshmallow dispenser looks like a cross between a photon torpedo tube and a shuttlecraft nacelle.